St. Jovite, Europe's Horse of the Year in 1992, was euthanized Jan. 9 due to the infirmities of old age at Michael Keogh's Ballysax Manor Stud in Ireland. He was 27. St. Jovite was bred in Kentucky by his owner, Virginia Kraft Payson. He was sired by champion Pleasant Colony, winner of the 1981 Kentucky Derby and Preakness Stakes. His dam, Northern Sunset (Northfields-Moss Greine by Ballymoss) was named Broodmare of the Year in 1995. Northern Sunset was purchased by Payson for $105,000 carrying her first foal, Salem Drive (by Darby Creek Road), who went on to be a multiple graded stakes winner. Her second foal was Lac Ouimet, a full brother to St. Jovite, who won such races as the G2 Jim Dandy and G2 Excelsior Handicap (twice) during a long and successful racing career. Northern Sunset is the third dam of 2002 G1 Kentucky Oaks winner, Farda Amiga, who earned an Eclipse Award as Champion 3-year-old filly. Northern Sunset was also the dam of L'Carriere (by Carr de Naskra), who earned over $1 million and was second to Cigar in the G1 Breeders' Cup Classic. St. Jovite was sent to Europe to race and was trained by Jim Bolger in Ireland. During his 2-year-old season, St. Jovite captured the G3 Anglesey Stakes and the G3 Futurity on his way to being named champion 2-year-old in Ireland. 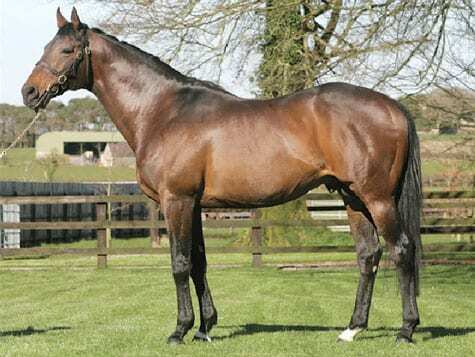 At three, St. Jovite set a new course record at the Curragh when winning the Group 1 Budweiser Irish Derby, a record which still stands to this day. St. Jovite then defeated older horses in the Group 1 King George VI & Queen Elizabeth Stakes, and was named Europe's Horse of the Year in 1992. St. Jovite first stood at Payson Stud in Lexington, Ky., before moving back to Ireland in 2006 to stand at Greentree Stud. He was pensioned from stud duty in 2014, and was retired to Keogh's farm at that time. This entry was posted in Bloodstock and tagged dr devious, Horse Racing, irish derby, jim bolger, lac ouimet, northern sunset, payson stud, pleasant colony, salem drive, st. jovite, thoroughbred, virginia kraft payson by Edited Press Release. Bookmark the permalink.